My Instagram TV channel is taking off and I am very happy to share my ride with all of my readers! As you have known if you have followed me for any amount of time this year, that I have been fully vested in making my IGTV channel the absolute best in social media, personal branding and project management. I use my IGTV to educate people in 3 areas: social media, personal branding and project management. I have worked very hard to deliver quality in social media, personal branding and project management. I am grateful for all of the views my videos receive because I know what it is like to not get the same help that I am putting out there. I like educating and helping people along the way. That is my nature. I like helping people accomplish their goals. I feel that when someone watches my videos, they are already committing towards pursuing their goals. They just need a little oomph to get them over the hump! That’s my IGTV channel’s purpose! Engagement. I like responding to comments. The one thing I truly love about increased viewership is receiving and responding to comments. For me it is a chance to engage with others. 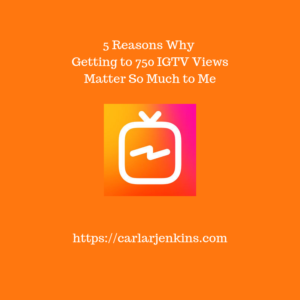 IGTV is in its early stages so there are not too many of us getting to 750 views. I am happy to be amongst the few. I look forward to getting to 1000, 5000, even 10,000 IGTV views with a burgeoning community of active viewers and commenters.